From the onset, this year’s general election in Kenya reads like a dry and dutiful political tale similar to a ghost story. The constituent being haunted is the Kenyan electorate. 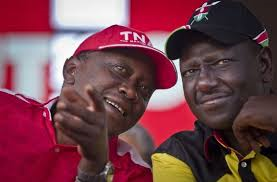 In an era of bland politicians, the Kenyan electorate appears jaded with the UhuRuto’s (Uhuru-Ruto) five-year political nuptials of spin and sofa governance, and has begun calling for a fracture from the current failures. Less than five months to the elections, President Uhuru Kenyatta’s chances of political survival increasingly appear to be hanging on a thread. As if to save himself, the president used his final State of the Nation speech to parliament on March 15, 2017, to reiterate his successes over the years and forge a picture of his re- election plan. In reaction, the opposition described the speech as a “public relations” exercise that failed to meet Kenyans’ expectations on the government’s scorecard; the president’s supporters in turn praised it as one of the best. To his credit, Uhuru Kenyatta’s administration has successfully overseen the issuance of over two million title deeds to the public and more than 800 more soon to be issued to public schools. Since 2013, his government has seen more than 22 million households and 22,000 primary schools connected to the national grid, this being an initiative of the last mile connectivity aimed at transforming the country into a secured 24 hour economy, creating some of the (500,000 per year) jobs that he promised in his manifesto. His administration has also ensured that vulnerable groups such as the disabled and elderly receive some handout from the state through the Inua Jamii cash fund programme where KShs 17.4 billion Shillings have been issued to over 725 households to date. On the agricultural sector, Kenyatta’s administration has also worked hard at reducing tax levies by tea farmers through subsidised fertilisers to maize, tea and coffee commodity producers. To his detriment, it is worth noting that his Jubilee administration has presided over one of the largest borrowing sprees in Kenya’s history, with the government debt as a percentage of GDP rising from KShs 800 billion to KShs 2.5 trillion by end of 2016. In early March, a local daily reported that the Government had signed nine loan agreements worth KShs 90.2 billion in foreign debt in the three months to January 2017. Critics of the government have pointed out that corruption has become more rampant during Kenyatta’s presidency than during his predecessors. Businesses also often cite pervasive corruption as one of the biggest obstacles to investment. Kenya has a history of multi-million dollar scandals that have failed to result in high-profile convictions. This has angered the public, who accuse top officials of acting with impunity and encouraging graft by those in lower posts. According to Philip Kinisu, former Ethics and Anti Corruption Chairman (himself hounded out of office in 2016 on corruption charges), Kenya loses a third of its state budget of $20 billion, the equivalent of about $ 6 billion, to corruption every year. Were such a sum not lost, it would be enough to cover most day-to-day state spending before investment items such as development projects. Looking at the president, he does not appear as much of an ideas politician; his approach to politics has been at worst simplistic and at best fixated on grand infrastructural projects at the expense of deep-seated social alienation in the country. His attitude of grandstanding, and at times wounding language in public podiums demonstrates a certain reckless and whiff of neocon about it. Arguably, it has led to his tenure being marred by industrial unrests with the strike by doctors taking more than 100 days to be (sort of) resolved. Lecturers in public universities have also just suspended their almost three month strike. Teachers and at times nurses on the other hand have had strikes almost every year since Kenyatta’s election in 2013. Two things have been starkly apparent in conclusion to the first term of his presidency. First, his approach to decision-making has simply been wanting. Second, his style of leadership has equally been baffling if not outright frustrating. Unnervingly, it is difficult to avoid the conclusion that he embraces in - in one respect - the governing style of his three predecessors; his own father Jomo Kenyatta (1963-78), his political godfather Daniel arap Moi (1978-2002), and his immediate former boss Mwai Kibaki (2002-13). This is because they all understood the role of the state to be the enabler of growth and the accumulation of wealth. That said, through their actions, all the three presidents simultaneously stifled growth by tolerating corruption, exhibited autocratic tendencies and encouraged ethnic division as a way of clinging on to power. Needless to say, to the fraught Kenyan electorate, the ascendancy to power by former International Criminal Court suspects, Uhuru Kenyatta and his deputy William Ruto respectively, has certainly been pregnant with meaning. Back in 2013, during the electioneering period, the notion of ‘our people’, by UhuRuto supporters effectively reformulated the quest for ‘truth-telling’ to a silencing rhetoric captured by the political elites’ and victims’ declaration as “we have moved on”. This notion of ‘moving on’ is a sad part of Kenya’s political culture that has for long enveloped gross human rights violations and stifled discussions and quests for any form of justice in Kenya especially during political campaigns. Whatever the case, the Kenyan electorate ought to take solace in the now famous advisory by Johnnie Carson, the former US assistant secretary of state for African affairs, that ‘choices do have consequences’. Meaning that a perverse result remains just that, a perverse result, even when it is sugarcoated with political pageantry. Ethnic arithmetic aside, one thing that is clear is that even the most politically unconscious Kenyan knows that there is a serious need for ‘real’ change of guard from the current travesty. Whether this objective is achieved by the new oppositional outfit National Super Alliance (NASA) or another alternative group altogether remains to be seen.